This toaster oven works well enough. It is not necessarily easy with all of the different knobs and settings but you get used to it. It is probably too big for my needs. Even Heating I have not noticed any problems with heating. It works well enough for toasting, broiling, and baking. Safety I have not had any issues with safety using this oven. The timer feature helps with that. Ease of Cleaning It is a little difficult to clean the outside and inside of this toaster oven. Even if you remove the bottom rack to clean, there are still crumbs under that that you somehow have to get out. Durability It has been working well for more than three years. I have not had any issues with durability. Design In one way the fact that the rack is connected to the handle/door is nice but on the other hand it makes it complicated when you need to remove and replace the rack. 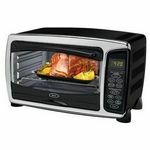 Oster Toaster Oven is a great addition to any kitchen! Nearly 5 years ago now, I registered for gifts for our wedding. Seeing as how we did things the traditional way and really were not going to be living together until our wedding day, there were plenty of things that we definitely needed. A toaster oven was top of my list. Why this one? Well, simply put, we were planning a "coca cola" theme in our kitchen and, to go with it, I was planning on all my appliances and everything in the kitchen to match. Since there wasn't a coke toaster oven, a red one would definitely fit the bill! Yes, I had a lot of requirements for a toaster oven, didn't I? However, I am so glad that my decision to go red led me to this little machine. It is so perfect! I can fit an entire meal in this for us. It easily holds up to 6 slices of bread to toast and 4 slices of homemade bread (homemade bread tends to be bigger slices). I use it for toast often. However, I also use it to cook on a hot day. It emits so much less heat than the oven. I have roasted chicken pieces in it, made pizza, garlic bread, hamburgers, steak, french fries, baked potatoes, and more. It is very simple to use and, the great thing, it has a timer feature so that it will automatically turn off in the set time. You could also choose to just leave it on until you turn it off. With a slide out tray, it is simple to clean crumbs and other things that might have dropped to the bottom. 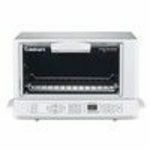 The adjustable rack allows you to sit things higher or lower to get more or less toasted/boiled. 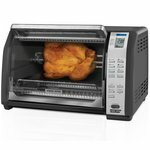 You can even adjust the head to various levels for toasting, baking, broiling, etc... It has a classy look and would be a perfect fit in any kitchen (it does come in more colors than just red, if you're wondering). Last year I bought the Oster 6295 Convection Toaster Oven from the television and it has stopped working. The convection toaster oven wasn't all that great to begin with. The oven comes with eight cooking settings. 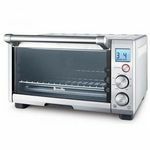 Bake, Convection Bake, Broil, Toast, Bagel, Pizza, Defrost and Dehydrate. There are two buttons to adjust the temperature and two buttons to adjust the cooking time. The only accessories that come with the oven are 9 x 13 baking pan and a grill sheet. I personally did not use the Pizza, Defrost and Dehydrate setting so I can't vouch for it's performance. The "Bake" setting was the superior setting. I had issues with the "Convection Bake". I felt like I had to cook things for a longer time even though the fan is meant to cook your food evenly and quicker. The "Broil" setting was sub par. I felt like the "Toast" and "Bagel" setting took too long and I was better off just using my plain old toaster. Now that oven is broken I'll need a new one. I surely won't be buying this model again. I actually picked this Oster Toaster oven up at a yard sale and it was nearly brand new. Apparently it was a gift the seller didn't want. I wanted a decent looking toaster oven to replace my hand-me-down one. I like the two racks and there is plenty of room to make a small casserole in it. It does not take long to heat up and it is easy to keep clean. The tray that came with it was ruined in a matter of months with the nonstick coating coming off of it. I just use foil on it now, but that is a pain. I also don't like the timer feature because it goes "tick, tick, tick" which is very annoying. So I just turn it on and set my oven timer. 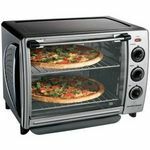 I have found this toaster oven most useful for toasting things like bagel pizzas or a few chicken fingers and fries. I don't use it to make toast because I have a toaster. I have made small casseroles in it with no problem. While there are two racks, if you load the top rack, and the bottom rack, the top rack will get very brown before the bottom rack is finished toasting. 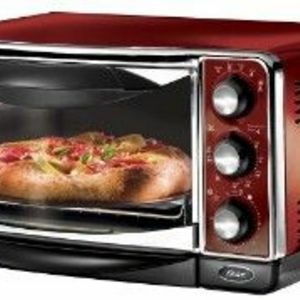 We bought this toaster oven last christmas.Beautiful color (metallic red).Worked fine.But it dosen't have a toaster thats uncomplicated,you have to set 3 knobs,then you usually burn it.So, you still have to have a pop up toaster on your counter. Next ,it only comes with one rack, but will take 2. The pizzas they say you can put in there ,would have to be those Totino things.It has the rack where you can put it in the notches and comes out as you open the door ,but it has to be to close to the element and then it gets stuck.Now,remember this isn't but a year old the door won't stay shut unless you prop something heavy in front of it.